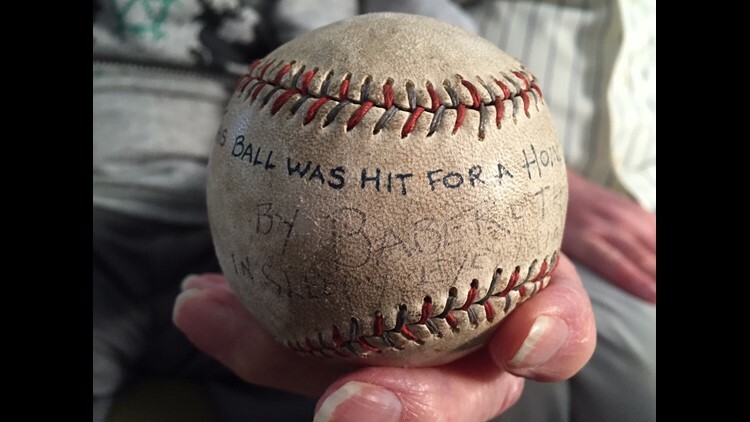 An 11-year-old boy who attended a 1922 Babe Ruth exhibition game in Sleepy Eye, is not only alive, but fetched a Ruth home run ball he's since given to his grandson. EDITOR'S NOTE: This story originally aired on Feb. 8. 2016. Len Youngman, 107, passed away this week. He died on the 96th anniversary of the date he snagged a home run ball hit by Babe Ruth during an exhibition game in Sleepy Eye. 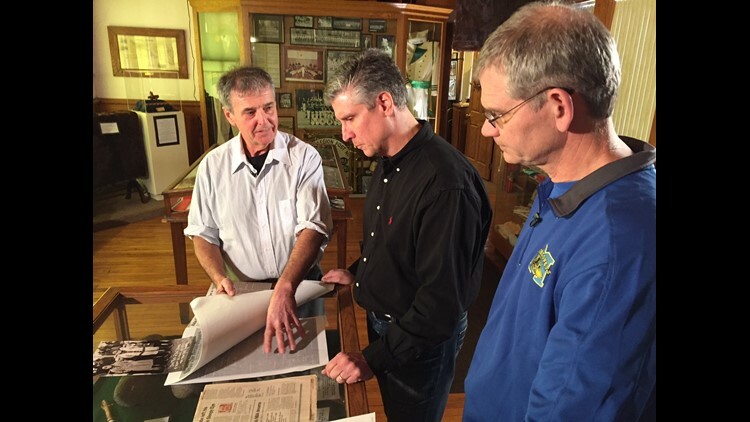 SLEEPY EYE, Minn. – Three friends with a shared obsession with the most famous sporting event ever played in their town, recently received the surprise of their lives. An 11-year-old boy who attended a 1922 Babe Ruth exhibition game in Sleepy Eye, is not only alive, but fetched a Ruth home run ball he’s since given to his grandson. 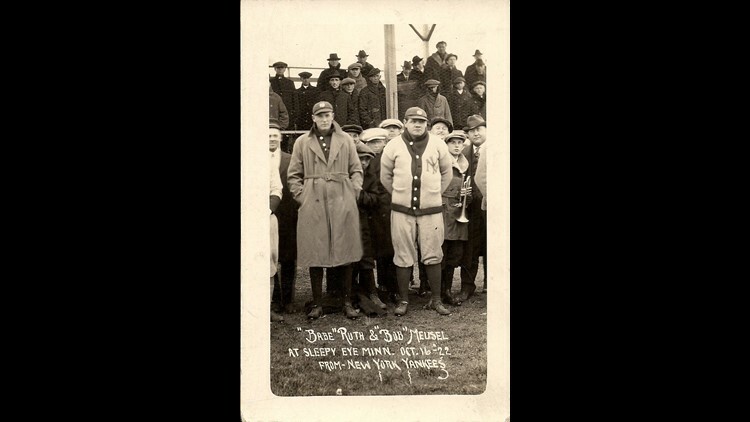 A baseball hit for a home run by Babe Ruth in Sleepy Eye, Minnesota in 1922. “My jaw about dropped onto the keyboard on the computer when I read that,” said Randy Krzmarzick, who received an email from the grandson. “I screamed to my wife, she was in the living room or something, and then immediately called these guys." 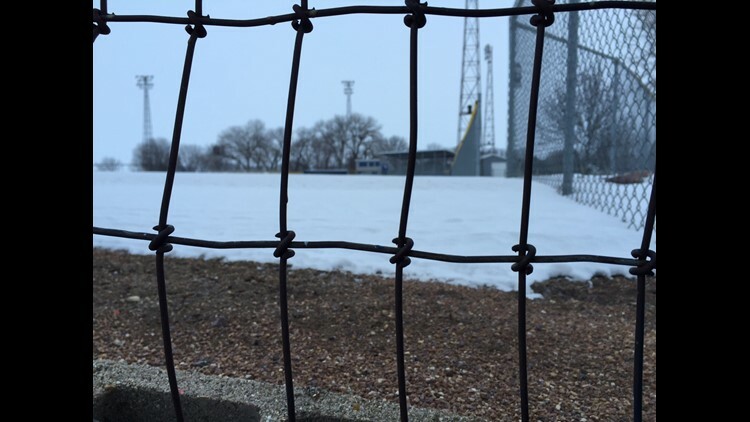 Krzmarzick, Dean Brinkman and Scott Surprenant have studied the game for years, even gathering at the local baseball field to mark anniversaries of the local classic. 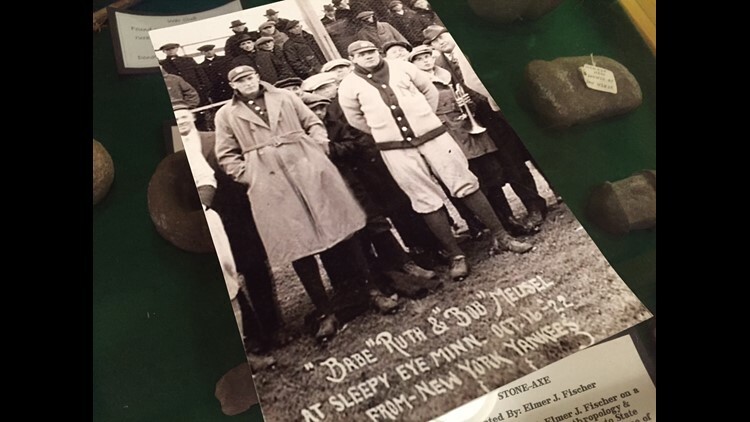 Photo of Babe Ruth and Bob Meusel displayed at Sleepy Eye Historical Society. Ruth made his Sleepy Eye stop with Yankees teammate Bob Meusel during a 1922 barnstorming trip that mainly took him to larger cities. “This is the biggest thing that ever happened here,” said Surprenant. The three friends are unsure how local boosters convinced Ruth to make a stop in such a small town. 104-year-old Len Youngman holds the Babe Ruth home run ball he fetched during a 1922 exhibition game the Yankees slugger played in Sleepy Eye, Minnesota. According to a newspaper account at the time, about 700 people attended the game on a miserably brisk October day. Krzmarzick, Brinkman and Surprenant believed the last attendee passed away five years ago at the age of 99. But then the email arrived from Joel Youngman telling Krzmarzick about his 104-year-old grandfather, Len Youngman, who lives by himself in Virginia, volunteers at the local hospital and still drives a car. Len Youngman grew up in Sleepy Eye and was 11 years old when Ruth and Meusel played the game with a group of local all-stars. “Whenever I’d ask him about it or it just naturally came up, he would just talk and talk about it,” said Joel Youngman, who received Ruth’s homerun ball as a teenager. The gift from his grandpa represented one of two home runs Ruth is reported to have hit that day. 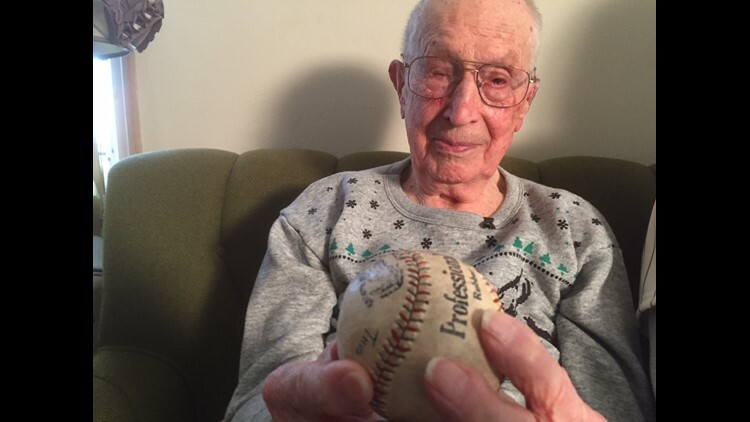 Len Youngman, who’ll turn 105 in March, says he was playing with his boyhood friends beyond the outfield fence when Ruth punched one out of the park. “And here comes this baseball flying way over the centerfielder's head, he didn’t even chase it. I picked it up and ran with it,” smiled Len Youngman. Len Youngman says he didn’t think to ask for Ruth’s signature on the ball and doubts anyone would have had a pen with them anyway. Ballpoints were not common at the time. Len Youngman did sneak himself into a photo with Ruth and Meusel. Youngman’s capped head can be seen peeking around Meusel’s back. Brinkman says it’s “probably the most well-known photo in Sleepy Eye history.” Up until Len Youngman emerged, the three amateur historians of the game had never been able to identify the boy in the photo. “Having something now almost 100 years later does keep this story alive. And to be honest and real, I didn’t think we’d meet anybody alive anymore,” says Brinkman. 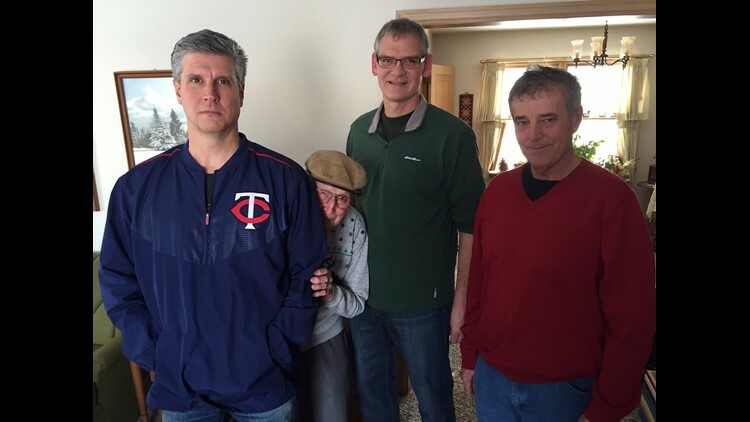 Late last month, the three friends drove five hours to Sleepy Eye to meet Joel and Len Youngman and see the ball. “I can’t imagine anyone coming this far, just for a damn baseball,” Len Youngman joked upon their arrival. After growing up in Sleepy Eye, Len Youngman moved to Virginia for work in the 1940s. Though he often shared his Babe Ruth story with family, somehow word never made it back to Sleepy Eye.